"Seek paleblood to transcend the hunt"
After the cutscene, you are prompted to name and customize your character, see Character Creation for help on with this. When you are done a 2nd cutscene begins, and you will afterwards gain control of your character. There is a note on a chair in that room that mentions Paleblood for the first time, read it before opening the door on the opposite side. You will find several messengers on the floor in this building, they give you tips and teach you how to play. Keep moving and you will reach a room with a Wolf Beast, attempt to fight it and if it kills you, you will wake up in Hunter's Dream. Note: It is possible to kill this Wolf Beast using your bare hands but it will take a while and you will not receive any substantial drop. Dodging behind it and using a charged R2, followed by an R1 attack will usually kill it. You can also run past the beast and up the stairs where you can open the door to leave the clinic. Once the door is open run to straight then make a left toward the gate and open it. After you open the gate you enter Central Yharnam. Next from the gate run up the path and take a left past the second carriage, the gate on the right is blocked. Hurry past the man and look on the left side on the ground for the lever. Pull it and the ladder will drop. Run up the ladder quickly and once at the top Sprint to the lantern, The man will still chase you so light the lantern and use it right away. Inside the Hunter's Dream you will see a hill leading up to the only building in the area. This hill has numerous messengers on the ground that will give you your starting equipment. You'll have a choice of three Right Hand Weapons: The Saw Cleaver, Hunter Axe or Threaded Cane. Further up the steps you can choose your Left Hand weapon, in this case a choice of two firearms: The Hunters Pistol or Hunter Blunderbuss. Once you have chosen your equipment, head back down the hill to the farthest Gravestone with Messengers at its base. These Gravestones act as portals to each Lamp you unlock throughout the game. Select the 1st Floor Sickroom and you will be taken back to Iosefka's Clinic. When you return from the Dream, light the lamp and go back up the stairs to the room you started the game in. The door to the room is now closed but there is an NPC on the other side that you can talk to. Iosefka will not let you into the room but she will give you Iosefka's Blood Vial. Now head back to the room with the wolf Wolf Beast and kill it. In the next room, on the left, pick up the 2x Blood Vials from the body and open the door to exit the building. Outside, pick up the 10x Quicksilver Bullets by the gravestone and open the gate that leads to Central Yharnam. If you head left you can find 4x Blood Vials. Going right, follow the road around to the left, but be prepared for a Hunter hiding behind the carriage. Deal with him and pull the lever against the wall to drop the Ladder. Don't climb it just yet, continue up the road to find two more hunters sleeping on the floor. Kill them and smash through the crates in the corner to collect 6x Molotov Cocktails. 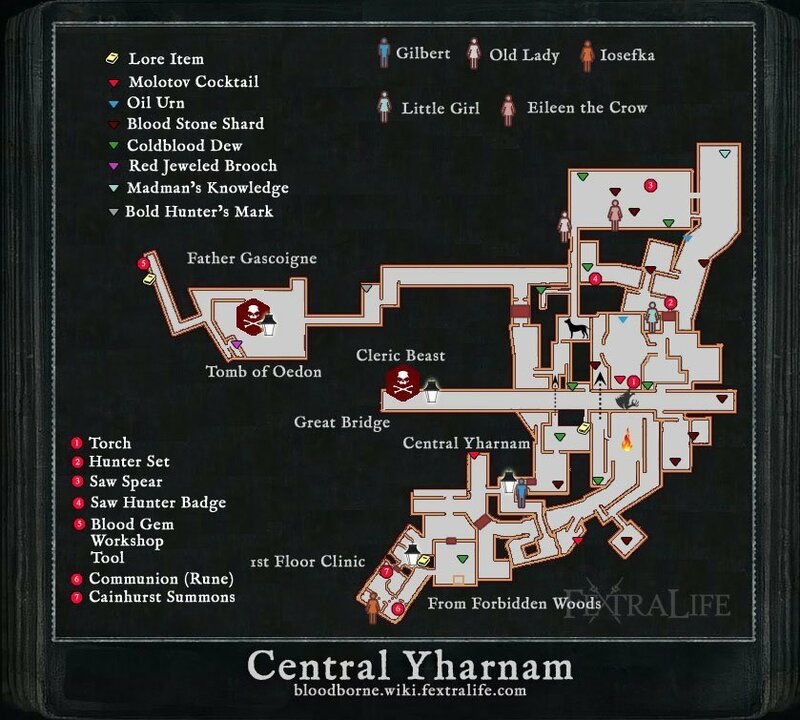 Climb the dropped Ladder and light the Lamp of Central Yharnam. The locked gate on the right when exiting Iosefka's Clinic is unlocked by progressing through the Forbidden Woods and also allows the player to access the back of Iosefka's Clinic. To access this locked area, waken at the Forbidden Woods and head straight until you reach the town area with the dog cages on the left side. After you kill the dogs, there is an obscured path off to the left which leads to a cave. In the cave, there will be a poison swamp and some giant enemies that you must traverse to reach the small passage with the ladder that takes you to Iosefka's Clinic in Yharnam. Once here, you may unlock the gate and head to the back where there will be a Celestial Host. After killing it, climb the ladder to the roof and kill the carrion crows. Now, enter the open window into a hallway in the back of Iosefka's Clinic. If you sent any NPC's to Iosefka's Clinic, you will find them as docile Celestial Mobs which drop some items. If you turn right, you can open the door to the main clinic room where you will find the Cainhurst Summons key item, which allows the player access to Castle Cainhurst. If instead you turn left in the hallway, you will find some items in a room, as well as a separate corridor area where the player will encounter Iosefka who warns the player not to approach. If the player approaches, Iosefka will become hostile and the player will not be able to speak to her from behind the double doors any longer. If the player enters this area after the Red Moon event has been triggered by defeating Rom, the Vacuous Spider, Iosefka will instead be found in a non-aggressive state on a table. Killing her now will cause her to drop a One Third of Umbilical Cord consumable item. I am not entirely sure what this is referencing to, but I don&apos;t think Gerhman appears anywhere in the Sickroom or the Clinic. The person giving you the injection is someone else, certainly not Gerhman. Hey, I think we should remove the redirect from Iosefka&apos;s Clinic to here. The two areas are linked, but very much different, and we want to be able to say that several NPCs can be sent to "Oedon Chapel or Iosefka&apos;s Clinic", since that&apos;s what it says in-game. The First Floor Sickroom refers to the starting area and the lamp. 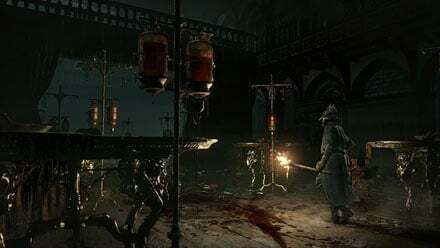 Iosefka&apos;s Clinic (or Second Floor Sickroom) refers to the place where Iosefka conducts her experiments, and the Cainhurst Summons can be found. What happens if you do not kill her after the blood moon? I have not made it that far, I just want to make slightly more informed Decisions. Anybody else went to Isoefka&apos;s clinic only to find just the celestial with isoefka&apos;s vial but not imposter isoefka? I don&apos;t find the lantern for Iosefka clinic, I came in from the forbbiden woods, Iosefka become hostile (I read the information for she become friendly too late ^^&apos; ) but after I kill her, I walk around but no lantern, did I miss it ? After gaining entrance to the back of the clinic, which I still find the level design of areas so fascinating how everything seamlessly connects (And nearly dying with 54,000 echoes to the Giants in the poisoned swamp of DEATH!) I entered the clinic and saw the weird looking Alien body snatcher celestial nasty thing, killed it and got vial of Iosefka&apos;s blood? I opened the doors and went back to the Dream. Spent my echoes and went back to further explore the Clinic, which to my surprise the doors were closed?! Iosefka greeted me and told me to send peeps to her... After that was all said and done I went back through the window entrance to explore around. Went into one area with a dead Celestial on a table? Went up the stairs to an empty room, went back to the doors which she talks to you, and... no one was there? I am so beyond confuzzled. I went back to the Dream, went back to the clinic and there she was again, telling me to bring peeps to her?! O.O WHAT IS GOING ON WITH IOSEFKA! On my first playthrough a lamp appeared right next to the Cainhurst Summons in Iosefka&apos;s Clinic. On the warp screen it was called "Iosefka&apos;s Clinic". I&apos;ve never had it come back in subsequent playthroughs? Does anyone know what triggers this lamp to spawn? Trying to recall my first playthough and I think I didn&apos;t send anyone to either place until after I had gotten inside Iosefka&apos;s Clinic. Perhaps that&apos;s the trigger. Just guessing right now. Can I grab without killing the impostor? Kinda need her for the red moon stage of the world. So the guy in the wheelchair at the beginning that does the contract and the blood ministration. First off, he&apos;s not Gehrman, and he&apos;s not Gascoigne. There&apos;s just no way. And proof for that, albeit still somewhat circumstantial, (besides having a totally different voice, face, hair, hat, and just generally being different) is that when you enter the Clinic from the back, and you explore around, you see a wheelchair. The only wheelchair in the back area of the clinic. With no one in it. And in a room to the left of the back door entrance, is the corpse of a small celestial emissary. If you don&apos;t send any of the NPC&apos;s to the Clinic, only the original Iosefka is there as a living transformed small celestial emissary. So why is there another one? It&apos;s gotta be the wheelchair guy. His wheelchair is there and he&apos;s gone without a trace. Most likely, Fake Iosefka transformed wheelchair guy into a blue alien dude thing. I&apos;ve scanned through comments and haven&apos;t seen anything about this - if I missed it, I apologise. I&apos;ve just defeated Rom, and returned to the clinic. I had accessed the place before, but not killed Iosefka - I&apos;ve killed her now and got the cord, if it&apos;s relevant, though I&apos;m not sure it is. I&apos;m now in the room where you encounter your very first enemy, and I hear someone crying - it sounds close, and I&apos;m wondering if it may be coming from up above on the balcony, and if there may be any way to access it. Has anyone else heard this, or know where it&apos;s coming from? So question...I haven&apos;t encountered Rom yet, but I decided to enter the clinic to get the Cainhurst Summons. I got it. There was a Celestial mob in the room with the summons. From everything I&apos;ve read it is supposed to be any npc that I sent to the clinic. I sent the old woman and the beggar. So I killed the mob hoping it would drop the Beast Rune. Fun fact, it dropped a vile of Iosefka&apos;s blood. Confused, I went to the area that the Iosefka fight is supposed to take place and it was completely empty. I definitely just killed Celestial mob Iosfeka and I have no idea why she was that way to begin with.